I'm watching the snow fall this morning and thinking what a beautiful way it is to finish up the calendar year. Just watching the quiet...before it changes over to rain or the kids come out and tromp it all down attempting to make Snowmen (which is great in a whole other way). In the practice of qigong, this is referred to as retreating into the energy of the North. Quiet, a rest time when we hibernate our thoughts and ideas... Turning our mental and energetic kettle on low, letting the flavors settle and rest together before developing into the new and bright energy of the Spring (East). This is one of my favorite times of the year. Take advantage of it for what is is, not what you would like it to be. Remain in the moment, let yourself settle in and gently rework your plans and ideas. Allow yourself some quiet time, give your body permission to rest and take a breath before you charge forward into your next adventure. Have a good new year...The Mind Body Spirit Marketplace wishes you well! *photo copyright Diane Fergurson. 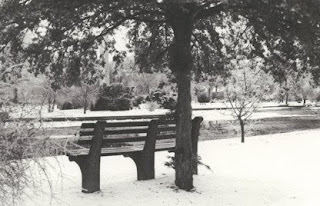 It was taken a few winters ago in a park in New Jersey. Yes, bet you didn't think Jersey could be so stunning in the snow!